Avoid the queues with a discreet VIP helicopter charter direct from central London (about 25 minutes), or a location close to you. Our friendly Operations Team have over 18 years experience arranging itineraries to suit every possible route and with our flexible booking system you can depart at a time that suits your timetable. Use the form below to get an instant estimate from your current location. During the flight you’ll have complimentary drinks and light snacks, along with the latest motor sport publications so you will arrive relaxed, informed and ready to enjoy the fastest growing motorsport on the planet. Our luxury helicopters are all twin-engine which makes them faster, able to travel longer distances and at night. Helicopter flight is not bound by timetables or location. You can depart from almost any place, there is room for up to 6 passengers and you are able to pick up from multiple locations. You arrive close to the action and when the race ends you are not immediately concerned about the drive back, by the time some people have left Silverstone’s car park you could already be at home. 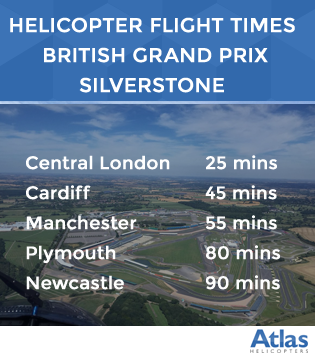 Call our friendly Operations Team on 0125 663 5000 to book your helicopter flight to the British MotoGP at Silverstone, or to inquire about any other motor racing event.